Knights of Malta to elect a new Grand Master – with a twist? This is interesting. Is someone backing off a little? On 29 April the Council Complete of State, the Order’s constitutional body, will elect the next Grand Master of the Sovereign Order of Malta (or, as provided for in the Constitution, a Lieutenant of the Grand Master, to hold office for a year). Following the resignation of the 79th Grand Master Fra’ Matthew Festing, on 28 January, the government of the Order of Malta – the Sovereign Council – met this morning in Rome, and established the April date. 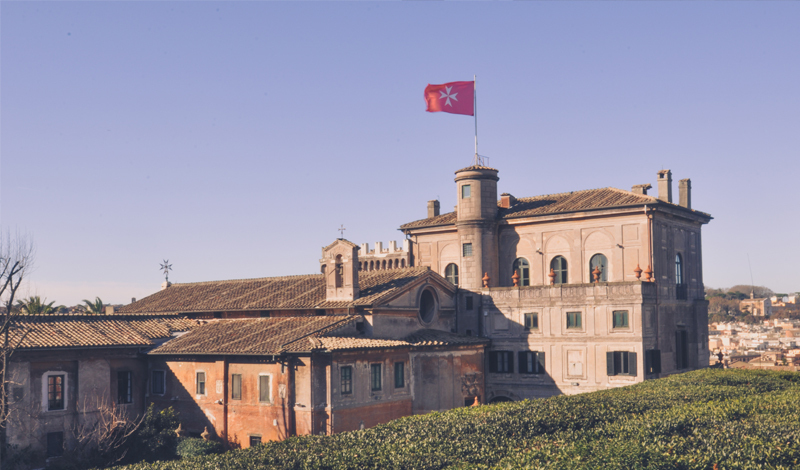 The Council Complete of State will meet in the Election Chamber in the Magistral Villa in Rome, the extraterritorial seat of the Order of Malta. The election of a Grand Master requires a vote of the majority plus one, according to Article 23 of the Constitutional Charter. Sixty members of the Order are eligible to vote: the Lieutenant ad interim, the members of the Sovereign Council, the Prelate of the Order, the professed bailiffs, two professed knights from each Priory, five Regents of the Sub-Priories and fifteen representatives of the National Associations. Isn’t that interesting? Is someone, somewhere backing away a little? This entry was posted in ¡Hagan lío! and tagged Edward Pentin, Knights of Malta, SMOM. Bookmark the permalink. 20 Responses to Knights of Malta to elect a new Grand Master – with a twist? Back away – who? A person who looses, or is defeated, or admits an error backs away. This isn’t Cardinal Burke backing away. To me, this sounds like professional image control……….. Win: get what you/they want working behind the scenes, pleasing one constituency Win: publicly appear not to care that you have won, pleasing another constituency. What a perfect set up. Ok, let’s speculate a bit. Suppose Fra’ Festing is re-elected. Then, if I’m not mistaken, everyone is exactly where they started, as Boeselager was reinstated in the interim. Now, on the surface a situation where everyone lets bygones be bygones seems a very neat way to reconcile everything, but how would that evolve? They have a state to run, and there was a clear, actual problem with actions, this was not (merely) an ‘incompatibilité des humeurs’. So, will Boeselager continue involving the SMOM with programs to go against Catholic teaching? If the answer is yes, the problem has just become worse. If the answer is no, Boeselager is unlikely to be able to function, as this reputation will be damaged, and his authority questioned in other matters. Sides will be taken, camps formed. (OK, strictly speaking this doesn’t have to happen, but I’ve yet to see an organisation that can manage such institutional meekness and personal forgiveness). Likewise, Festing will clearly suffer from damaged relations with the Vatican, accepted or not. People will operate behind his back too. And he’ll probably think twice and then some before he again decides on disciplinary action against someone in the SMOM (unless he has the courage of a lion). It seems to me that whatever the outcome, this is likely to fester for a long while still. Unless the knights are all very holy men indeed. Let’s pray they are! 1) I am betting certain folks are confident that won’t happen and I will not be shocked if Boeselager gets the post. Consecrated knight or not. 2) Even as #3, Boeselager is in a protected position now (“guy with upper hierarchy friends.”) How does one run an organization under that? 3) The pope has a special envoy in place for the foreseeable future. Again, how does one run an organization under that? Hopefully not. In the recent press conference, he said that he was actually what many would call “conservative”. I thought the Pope’s delegate was only there until the election of the new (or old?) Prince and Grand Master. I am really praying that Fra’ Matthew Festing is re-elected. He did not deserve what happened to him, and it would be a strong show of confidence in him and the direction of the Order under his stewardship, and a defeat to the German contingent. What has the Pope’s “acceptance” of whoever is elected got to do with it? It is supposed to be a “sovereign” Order. That was breeched when the Pope asked Festing to resign and he followed the Pope’s instruction. He should have told the Pope to mind his own business! The word “Sovereign” means Independent i.e. “beholden to no-one”. It’s easy to accept what you know won’t happen. Hm, that would be funny. So then the outcome of this series of events is that all remains as it was with SMOM but Cardinal Burke is sent to Guam. What, one wonders, is going on? But have the ‘tone setters’ of this triumphed thoroughly, or are many others prudently biding their time? Edward Pentin seems to have sources – perhaps he’ll fill things in a bit, soon. And didn’t the Gallen Mafia brag about influencing the outcome of a certain election…. Father Z, God love you. I am getting weary of the rumor mill and blog sites making fantastically terrible claims and predictions about what the Holy Father is going to do next. The deaconette thing is, for me, one of the worst and turns my stomach. If that goes through, I am self-labeling as a traditionalist (which would not surprise those who know me..at least most of them). That said, the local Ordinariate parish is where I would call home, since I know not Latin (my apologies…er, mea culpa – I think). I am tired of this parenthesis. I will keep up though, and go to Confession as you so often exhort us to do. I’ve got to stop reading the fringier Catholic trad blogs, however. I’ve missed the thing with Card. Burke going to Guam. Could someone tell us more about that? Is he leaving the SMOM or is the Guam appointment an additional task? Festing is an Englishman, he’d never accept the job again on his honour. And he shouldn’t. Nothing can salvage the situation they are in. Pope Francis has shown his power and got what he wants. The Grand Chancellor has a roof over him, and can do as he wishes. Fra Festing, I understand, one of a very small pool of eligible candidates, and gets on well with the Pope. Pope Francis will have shown his supposed mercy, the magnaminity of a winner. I agree with our host that we should not be concerned about Cdl. Burke going to Guam. An archbishop should be tried by at least another archbishop, even better a cardinal. Who is better qualified? (And besides, he doesn’t have any other demanding duties at the moment.) The principle that witnesses should be interviewed and the trial should be held in the place of the crime is sound; it applies in U.S. law. And it is hardly a long-term appointment, like nuncio to Fiji. Yet in the current climate, anything can happen. But whatever evil treatment might be in store for Cdl. Burke, it is going to happen whether he goes to Guam or not. I am confident that wherever he is, Cdl. Burke will seek the face of the Lord. We search “Cardinal Burke” and “Guam”. On phone with small keyboard or I’d give direct link or explain. This is still a tempest in a teapot. I wonder if HH didn’t ask HEH for his resignation to show him that turn-about is fair play, and HEH called the bluff. I agree with Mr. Reiss that Fra’ Matthew is unlikely to sign up for a second helping of abuse, when he can retire quite comfortably and not be afflicted with the burden of being responsible for a large organization over which he really doesn’t have too much control. But Boeselager won’t be elected. Can’t be. He is married and only quasi-religious, like a deacon who promises obedience but swears no vows, yet without the benefit of being in the clerical state. How could he be the Ordinary for men in solemn vows? Can’t be. Moreover, there have been no changes to the constitution to make non-professed members eligible for election as Grand Master, and HH hasn’t made any motu proprio to that effect, which he might have done. Watch for something like this to play out: a Continental Knight of Justice will be elected (this is my suspicion after two Anglophone Grand Masters, maybe from the Black Nobility to not favour the German or English speaking priories); there will be a constitutional amendment of Article 13, Paragraph 2 (“The Grand Master and the Lieutenant of the Grand Master must have the nobiliary requisites prescribed for the category of Knights of Honour and Devotion,” which is to say in essence, to have proven nobility of at least all four grandparents. This will obviate a lot of infighting be cranky old Europeans who constitute an ever diminishing proportion of the Order’s membership); Burke will stay because there is, (just now) no where else to put him. This is all based purely on my own suppositions, and I am not privy to any kind of information regarding this that is not available publically. Dear Majuscule, of course I know how to google! But it’s often hard to put a picture together when there is so much desinformation on this kind of topics on the Internet. I was just hoping Fr. Z would comment more on why Burke is going to Guam and, lo and behold, he did in a later blog post! Thanks Fr. Z!